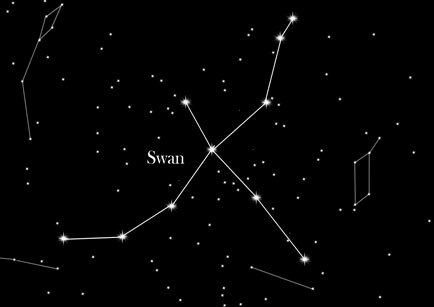 One of the most beaitiful constellations of the night sky is the Swan, also known as Cygnus. Very elegant and with wide swinging wings sliding on the Milky Way. Due to its form it is often referred to as the Northern Cross. This constellation is one of the 48 ancient constellations, as already mentioned by Ptolemy. The space telescope 'Kepler' has recently discovered another "Swan" about 2,000 light years away in another solar system in which six planets are located. The two lines of beautiful stars give an amazing impression of this constellation. The brightest star, Deneb, represents the tail and the rest represent the swan and its long, outstretched neck. By the Swan pulls the bright band of the Milky Way and this can be the swan to a highly interesting observation field are. The Greek god Zeus is said to have seduced Leda after she had turned into a Swan. The gods often turned into animals, not immediately recognized as the gods they were. Leda was the wife of the Spartan king Tyndarus and with this they slept that overnight. Later, she laid two eggs, one of which had a divine nature, the other egg was human and therefore mortal. From the egg with a divine nature, the beautiful Helen and Pollux hatched. Of Helena, we know that she was considered the most beautiful women of her time. This beauty is so even have been impressive, that every man who saw Helena, wanted to own it. Even at twelve years old, she was kidnapped by Theseus and Pirithous and then freed from their brothers. From the other egg hatched Clytemnestra and the twin brother of Pollux and Castor. To honor this double procreation, the Swan was placed forever in the sky.